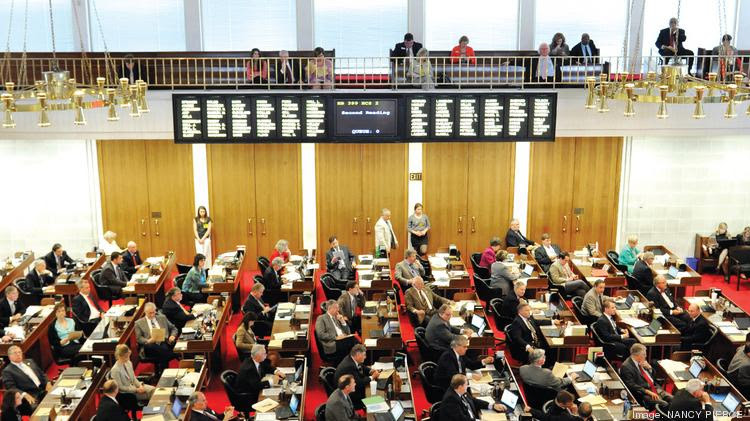 Two N.C. House committees approved a bill mandating a competitive-bidding process for utility-scale solar construction and encouraging development of rooftop and community solar projects, sending it on to a first vote on the House floor Wednesday morning. The House Energy and Public Utilities Committee, where the bill originated, passed it unanimously Tuesday morning and sent it on to the House Finance Committee for a vote at noon. While there were a few questions raised and some skepticism expressed, the tone at the energy committee was almost unfailingly positive. Donald Bryson, state director for conservative group Americans for Prosperity, gave a short statement during the public comments on the bill. Though AFP had announced reservations about the bill on Monday, Bryson told the committee it “does far more good than harm” and said his group supports it. On the much more liberal side was Rep. Pricey Harrison, D-Guilford, a committee member and longtime champion of solar and renewables in the state. She wondered aloud whether limits the bill imposes on new programs that would allow leasing arrangements for residential solar and development of community solar programs (neither currently permitted by state law) will prove too strict. But she ended saying, “this bill does a lot of good for renewable energy in the state,” and supported it. During the committee hearing, Kendal Bowman, Duke's vice president for regulatory affairs and policy, said that Duke estimates it would save about $850 million in solar power purchases over the next decade if the bill is adopted. To arrive at that figure, Duke estimated how much solar power it would purchase from new projects over the next 10 years. It projected how much it would pay if the state's current regulations remained in place as well as its cost if the competitive bidding and other more market-based procedures in the bill were implemented. Those savings would be passed on to customers. The brief and generally friendly sessions in the Legislative Office Building contrasted with the arduous — and sometimes contentious — nine months of negotiations that went into producing the bill. The state’s dominant utility, Charlotte-based Duke Energy (NYSE:DUK), and the solar industry and its advocates were long at loggerheads over a consensus bill. Eventually, energy committee chairs Reps. John Szoka and Dean Arp took a direct hand in forging the consensus bill. The agreement they worked out with the various sides was used as a substitute for the text of an innocuous bill in their committee that the pair had introduced in early April. It settled at least parts of the battle between Duke and the solar industry by giving utilities more control over where and when new solar projects are built. It shortens the terms for solar contracts and significantly reduces the size of projects that qualify. But it also establishes a bidding system for new solar construction. That is administered by an independent third party, assuring solar developers that they will not be completely at the mercy of Duke. Duke’s two North Carolina utilities must agree to purchase about 2,660 megawatts of solar through the system through roughly the end of 2020. And those projects that go through the bid process will be able to have the longer contract terms that utility-scale solar developers say they need to make their projects financeable. It also has several provisions that could boost what a close-to-moribund rooftop solar industry in the state. It requires Duke’s utilities to develop a rebate program for a residential and commercial rooftop solar program. And it would allow solar installers to lease projects to customers, to reduce upfront costs for roof top solar. Leasing programs would be limited to 1% of peak demand for each utility. And the bill sets up rules for community solar programs. Each utility’s program would be limited to 20 megawatts total, and it must offer the power to customers in its service area. No solar farm in the program could be larger than 5 megawatts. The limits on those programs were one of the concerns raised by Harrison. But the leasing limit, at 1% of peak demand at Duke’s two utilities, would be 250 megawatts, says Duke spokesman Randy Wheeless. Across of all of North Carolina, Duke currently has only 50 megawatts of rooftop solar on its system. So Wheeless says there is plenty of room for growth. North Carolina has long lagged in residential and commercial solar despite its strong utility-scale solar development. Low utility rates and some policy issues surrounding net metering have made solar less attractive here than in many top solar states such as California — the only state with more solar on the grid than North Carolina — Arizona and New Jersey.